Lynn Sunico of Manila’s Skyline Restaurant has provided her immensely popular and delicious recipe for a version of the Spanish cocido, a favorite Sunday meal in the Philippines. 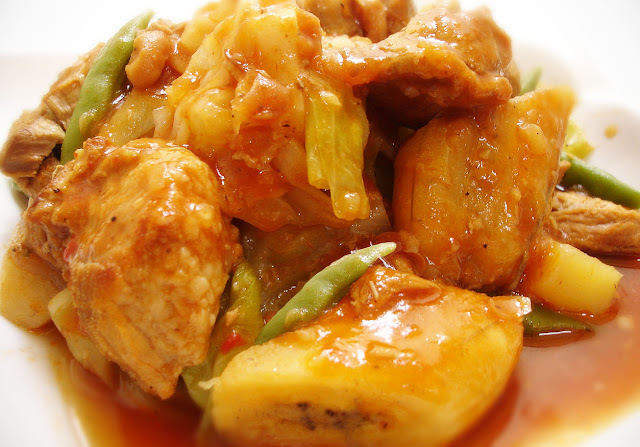 This recipe includes chickpeas and plantains or saging na saba. 2 Place the meat and sausages in a large pot with the water, salt and spring onion, and bring to a boil. Reduce the heat and simmer, uncovered, over medium to low heat until the meat is tender, about 45 minutes. Drain the meat and sausages, and set aside. Reserve the stock. 3 Heat the oil in a pot and stir-fry the garlic until golden brown, then stir-fry the onion until translucent. Add the tomatoes and tomato paste, and cook until soft, about 5 minutes. 4 Add the reserved stock and bring to a boil. Add the cabbage, green beans and plantains, and cook for another 5 minutes. Add the meat and sausages, potatoes and chickpeas. 5 Season with the salt and pepper, and simmer for a few minutes. Serve with a bowl of the Eggplant Sauce on the side.